The SweetWater Music Festival presents a special winter concert, Up Close & Personal: Mark Fewer and Daniel Janke, Saturday, February 18, 4 p.m. at the Harmony Centre (890 4th Ave. East, Owen Sound). This unique music event will feature selections from a new recording by the long-time collaborators, Celestial Blue. Janke composed the works for violin and prepared piano inspired by spiritual music. The afternoon programme will be focused on these unique pieces. The compositions have strong references to gospel and other folk traditions: music that resonates deeply for both Mark (with his Newfoundland roots) and Daniel (with his Ontario gospel roots). 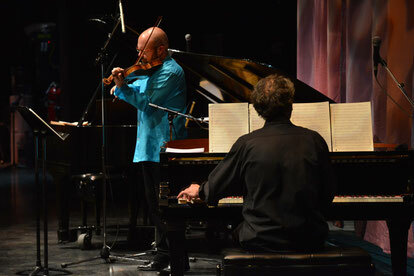 Janke and Fewer have previously collaborated in concert, on film soundtracks, and on recordings. Most recently, they worked together to create the soundtrack for Chris Landreth’s short film, Subconscious Password. Daniel Janke, who grew up in the Walkerton area, is well known as an accomplished composer and pianist. He’s composed works for the Penderecki String Quartet and Ensemble Moderne du Quebec. He’s also performed with numerous musicians including Holly Cole and Bruce Cockburn. Plus, he has made several films including his recent debut as a feature film director, The Grubstake Remix. SweetWater Artistic Director Mark Fewer will also provide a preview of what’s coming up at SweetWater 2017 in September. This year will feature a special all-Canadian Saturday night to mark Canada 150. Tickets are still available: General Admission - $25 ($30 at the door) and Student - $10. If you get tickets at the concert, "Tickets for 2" lets you and a family member or friend get 2 tickets for $50 ($10 off at door). Advance tickets can be purchased at the Georgian Bay Symphony office (994 3rd Avenue East, Owen Sound) or online CLICK HERE .